Hey, Moon! Get out of the way of Cassini! That is to say, Cassini saw the Moon transiting Earth. Which, on its own, is neat. However, it could have been a big problem. Look at where the Moon is -- and consider the reason why Cassini turns to Earth. Dave tells me that as of the moment simulated in this image, Cassini was, in fact, in radio communication with one of the giant antennas of the Deep Space Network situated at Goldstone, right here in southern California. 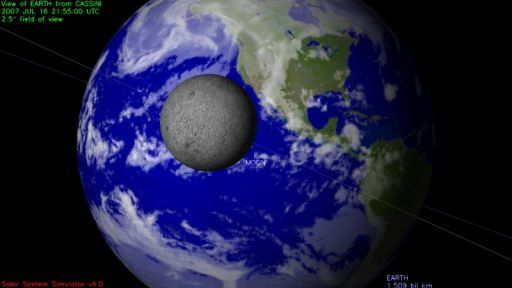 Just a tiny tweak to the geometry of this lunar transit would have resulted in the Moon being bang in the way of Cassini's attempt to radio valuable science data to Earth. Dave also said that if the Moon is sufficiently close to Cassini's radio beam, it's possible they'll see higher "system noise temperature from the radio reflections from the Moon being near the primary beam / in the sidelobes." Sadly, I can't say I know enough about radio transmissions to quite understand what Dave is talking about here, but I reproduce the information for those of you who do. Dave also said that the navigation team -- which uses Cassini's radio signals to track the speed of the spacecraft -- might see a signal from the occultation in their Doppler data, one when the downlink signal gets "lensed" by its passage near the Moon, and another one that'll happen one round-trip light time period later (which is I think about 170 minutes right now), after the uplinked commands are radioed back to Earth (something that Cassini does as a check to make sure it received the uplink correctly). I wonder if the Goldstone operators looked out their windows and said, "hey, it looks like the Moon's right where we're pointing our antennas..." It's probably the closest lunar occultation of a Deep Space Network station that Cassini has had. Do the Goldstone operators have windows?